Sean Kelly Gallery is delighted to announce an exhibition of important new works by Helmut Dorner. 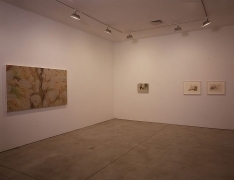 This is Dorner's first solo exhibition in New York since 1999 and his first at Sean Kelly Gallery. In the mid 1980s Helmut Dorner emerged as one of the most significant abstract painters of his generation, achieving widespread recognition through major solo and group shows worldwide. Dorner has exhibited with the eponymous Konrad Fischer Galerie, Düsseldorf, Germany since 1988 and was included in the influential Documenta IX in Kassel, Germany, in 1992. Born in Germany in 1952, Dorner studied under Gerhard Richter at the Düsseldorf Art Academy from 1976 to 1982 and has been Professor of Painting at the Staatliche Akademie der Bildenden Künste Karlsruhe, Germany since 1990. Helmut Dorner's exhibition is comprised of a major body of new paintings that both employs and expands upon the lexicon of abstract painting. Whilst Dorner's work has been identified as referencing the Romantic tradition in German art, as typified by such diverse artists as Casper David Friedrich, Joseph Beuys and Gerhard Richter, it is perhaps more accurate to reflect upon his interests in the work of painters as various as Gustave Courbet and Robert Ryman and the poetic aspirations of artists such as Blinky Palermo and Richard Tuttle. Dorner's recent paintings are complex interventions utilizing a Plexiglas substrate rather than the more typical materials of canvas or linen. The works are created with successive layers of lacquer that exploit the correspondences and harmonies of seemingly discordant colors and forms. The resultant works challenge traditional precepts of painterly space, the function of the act of painting itself and widely held conventions of aesthetic beauty. Dorner's use of Plexiglas allows the viewer not only to look at the work, but also through the work, a metaphor for looking within oneself for inspiration in interpreting the meaning of his paintings and his use of the picture plane. While the technique and 'action' of painting is present in all of his work it is not the subject of his paintings. It is perhaps more accurate to identify his work within a poetic or existential tradition, which employs precise conceptual stratagems. His work is included in museum, public and private collections worldwide. Seminal solo exhibitions have included han, Hans-Thoma-Museum, Bernau, Germany; Helmut Dorner, FRAC d'Auvergne, Clermont-Ferrand, France and Kunsthalle Bern, Switzerland. His work has recently been included in several group exhibitions including: Zoom - Ansichten zur deutschen Gegenwartskunst, Sammlung Landesbank Baden-Württemberg, Galerie der Stadt Stuttgart, Germany; Peinture, FRAC d'Auvergne, Clermont-Ferrand, France; Visions of the Fundació la Caixa, Contemporary Art Collection Fundació 'la Caixa', Palma, Spain and Nuevas Abstracciones, Museo Nacional Centro de Arte Reina Sofia, Madrid, Spain.